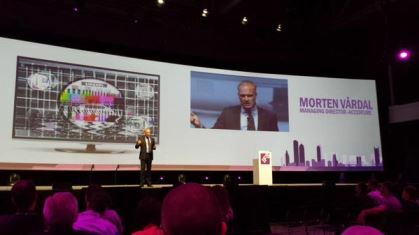 The first of Alastair Sorbie’s Diamond Sponsor guests presenting to the thousand-strong IFS crowd was Morton Vardal, the managing director of Accenture, the world’s largest consulting firm. After observing that nearly half of major companies from the turn of the century are no longer around today, Vardal posited that the remedy to the sometimes devastating impact of emerging disruption is a combination of innovation and cooperation. He stressed the need to “stay close to customers,” to grow together. There should be more complementary services around IFS, be they digital or app management. This will allow everyone to step up. Using the Nordic market as its focus, Vardal listed the three aims going forward for IFS and Accenture, to help everyone best prepare for the disruptions to come. Increase the IFS footprint around the world. It’s now being used by more than 1 million clients; and that number should continue to grow. Build a strong, durable IFS best practice. Build a strong application management and offshore practices. The case-by-case cooperation is enabled by “partner-friendly” IFS Applications 9.